Ben DO1BEN - it's me, Peter DO7VD, Uli DD3EU and Uli DL7UB where active from the old historic Lightship Laesö Rende from June 22nd until 24th 2007. 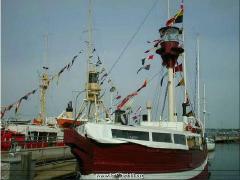 The historic lightship is located in the harbour of Heikendorf, a small town near Kiel. We used the calls DR9L/p and DA9L/p. TRX: Yaesi FT847, Heil Headset and Dipol Antennas for 10 to 80 meters. The antennas were mounted on top of the masts of the lightship. Power: 100 Watts only. We made a lot of interesting contacts. Sometimes we got a little pile up as we made the call as: " cq cq cq this is DA9L, DA9L/p Lightship on the air ... "
During our activity we run a webcam. The visitors of our webpage could see the operator at work or pictures from other parts of the ship. On one of tis picts shows the whole crew. 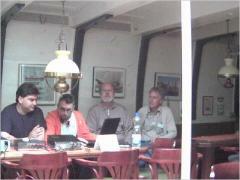 From left to right: Uli (DD3EU), Ben (DO1BEN), Peter (DO7VD) and Uli (DL7UB).